I love it when people make up new words that carry a wonderful potential meaning! This particular one happened a few weeks ago at the chalet during one of our last ski weekends of the year. I don’t remember the exact context but we were in the kitchen getting lunch together, and my older son said something and stumbled his way into the word. He meant to say something else, but I got the drift. I also ran to get my phone to type it in – what an awesome word! What does it mean? I don’t have a clue, but I like it at the the time. It fits my mood this morning. I’m in the midst of a major project that will last the week – I’m feeling a bit overwhelmed by the scope of the work, the details involved, the intense focus it is requiring, the … wait, I just had a thougt. It’s not that I don’t like the project – I love it, and the end result will be absolutely wonderful! It’s just overwhelming, to such a degree that my mind feels – well, over capacity! 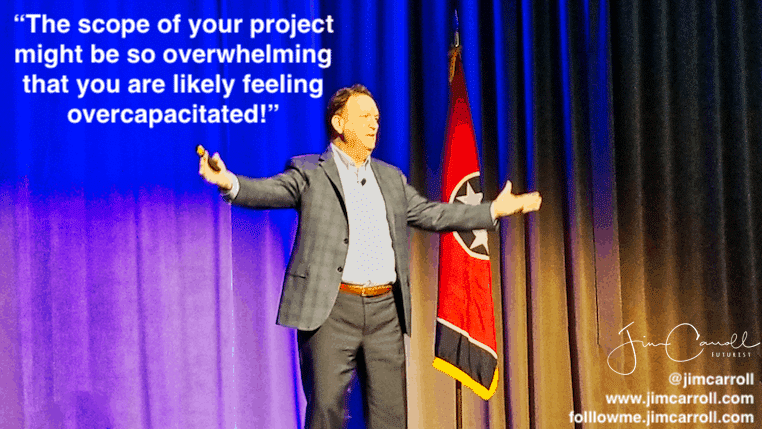 The fun part is, it’s not a bad feeling being overwhelmed by a great project – and that is probably what has driven great innovators through the years. If the picture of the end goal is clear, and the potential pathway can be seen, then there is a route to success. It’s just along the way, being overwhelmed is a normal part of the process. So today – if you are feeling overcapacitated by things, that’s probably a good thing!